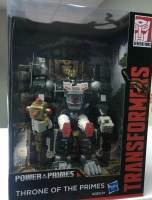 A lot of Transformers fans had been speculating that the Power of the Primes Optimus Primal might have been getting a red and blue Optimus Prime deco as Primal Prime. Thanks to this post on Baidu, we can confirm that Hasbro has taken that idea and taken a sharp steer in a different direction. 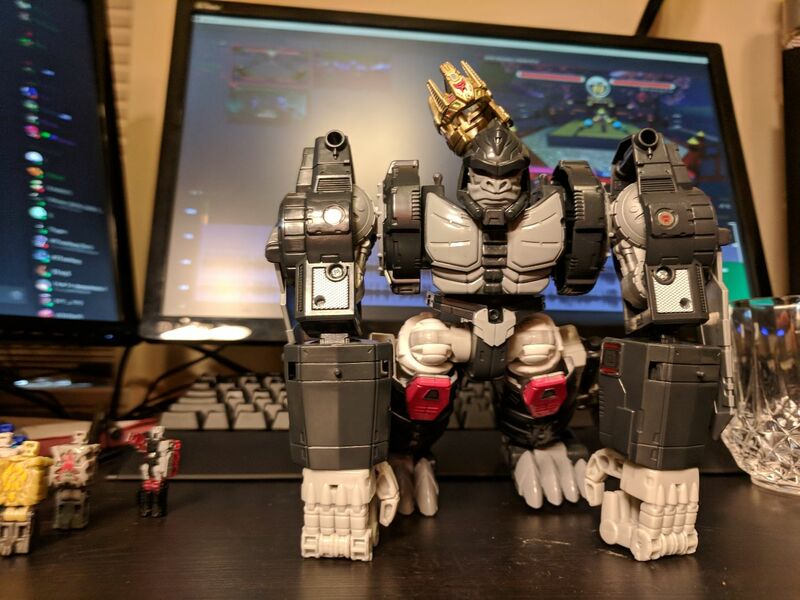 The “Throne of the Primes” figure is a season 1 Optimus Primal deco applied to the Power of the Primes Optimal Optimus, a cool black deco for the character that is unprecedented for this particular iteration of Optimus Primal. 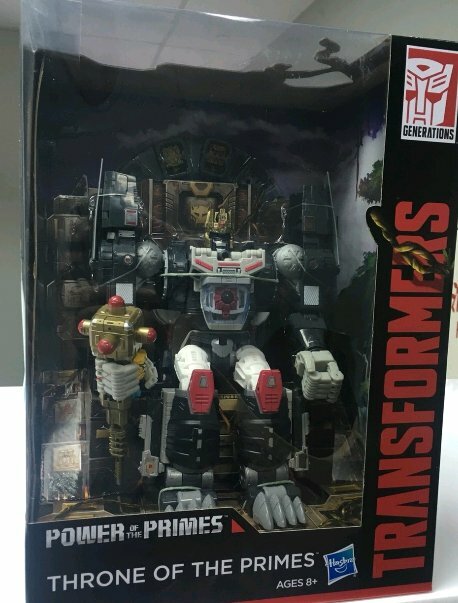 To make this package even cooler, he’s packaged seated on a throne with some exclusive Prime Masters packaged in a sort of Mayan calendar design, with the Maximal symbol also visible right behind the head. He’s also got extra accessories, including a crown and a large, squared staff. 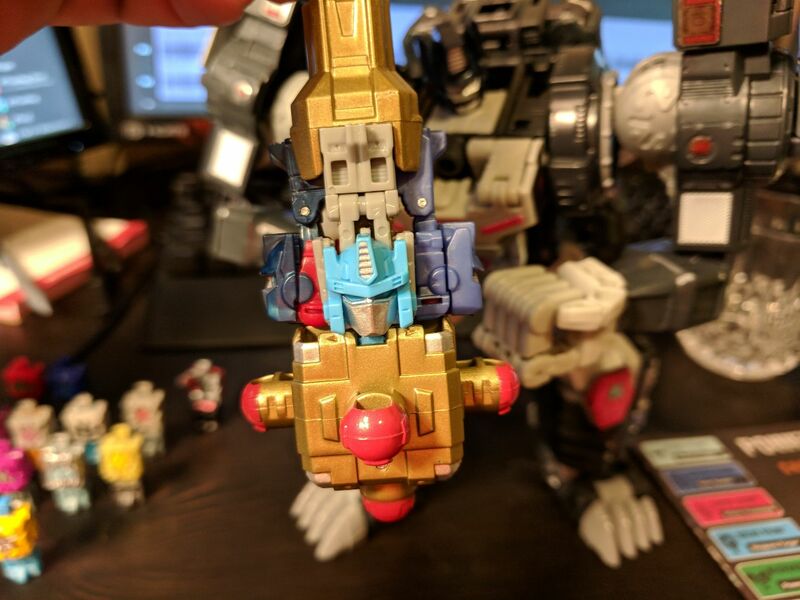 If you look closely below where Primal’s fist grasps the staff, you can see this set comes with an exclusive Prime Master, which seems to be an exclusive redeco of the Onyx Prime that comes with Predaking. We’ve not yet got confirmation how this figure is coming to us, but it’s been observed that the set is in English-only packaging, which implies it is an exclusive release, and given the timing, we can speculate this one might be another upcoming SDCC exclusive release. Is this something you’re excited for? Share your thoughts in our discussion thread linked below. Mine arrived Monday as well. It was very well packed as always. I'm glad I ordered through Amazon.jp even though it meant a later arrival. Amazing how fast AJP shipping is, as I completely forgot I ordered him. Soooo glad I opted for him instead of classic BW colors. Really makes the PotP theme work here. Now to get the upgrade kit. Paid Amazon Japan on Friday the 25, and got my package today! Got my set yesterday and I gotta say I love it very much!! Hating that the stickers rub worst that on the Rodimus mold but oh well. Remove the base then cut each piece of tape or remove it really carefully and unfold the entire throne to easily remove the tape and plastic you don't want. I'm new to this site and I couldn't find a edit button. Mr. oage you know you can edit your post, right? Throne of the primes page on HTS in now gone. Don't know if it'll be back again. Someone should make a upgrade kit of armor for this figure so he can carry about 8 Prime masters in them while the four are on his staff and the 13th is in his matrix so he can wield all the power of the primes. This is without a doubt the worst Generations figure I've ever owned, and im pretty forgiving. I already don't like the fact that the stickers on the side of optimus primal's cockpit are already starting to peel. How can we protect these things? My first purchase of this mold and will use him for my CHUG Primal. Optimal Optimus will probably be filled by the PE Effect version. I have the mismatched shoulders but I'll fix that when I get home. A fun figure for what it is. I do feel sorry for the Prime Master collectors that this is the only way to get the remaining 4. Hopefully you guys can complete your collection without too much issues. Super happy with the figure. Glad this is the version of the mold I own. Can't stop fiddling with him! Any idea on removing the wheel so one might see all the prime masters at once? And where you could attach it so the ratchet stays functional? The wheel is pinned in place with a two piece plastic mushroom pin. The ratcheting comes from the plastic housing I think, so you could take it off and then cut out clear plastic to make the ratchet work again.